LVL Lash Lift // Yes or No? After brows, lashes are the next more important thing in my face. I love some naturally defined brows and long, fluttery lashes and that was something I did not have. No matter how much mascara I would apply – waterproof or not – and no mater how long I spent curling them, they simply wouldn’t change. Flat, short and not at all voluminous was all that I was having. Also, the curl would old a bit better in one eye than the other (as you might see from the picture above) and that wasn’t a look that I loved but here was honestly nothing I could do about it. And I know everyone says that you should love yourself no matter what and I do. But I would love myself even more with big lashes that would make me look fresh and awake at any time. Whilst a lot of people love some eyelash extensions, I am not that kind of gal. I think it does not last very long, it takes a lot of maintenance and it does not look great when they start falling here and there. Also, they can look very unnatural but again, this is personal preference. I was looking for something that would last me quite long, not too expensive, easy to maintain and also that would look natural as my own lashes. LVL Lash Lift was not something new to me. If you read/watch Victoria’s from In The Frow or Anna from The Anna Edit, you are well known to this treatment as they both rave about and can love live without it since the first time they had it done. And since that first time, I had this in the back of my head where I always wanted to try at least once to find out if it was or wasn’t for me. 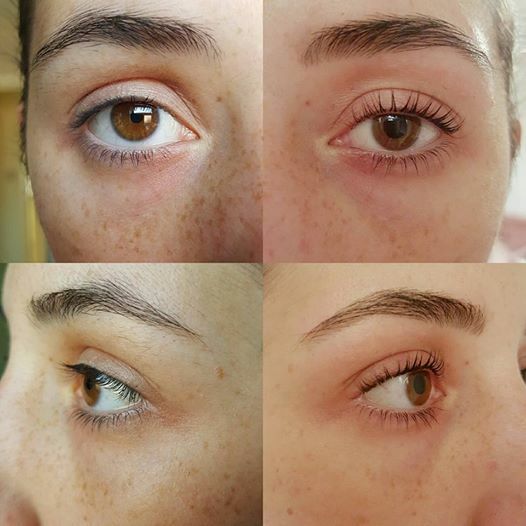 Recently, I went on the Nouveau Lashes website to find all about this treatment and also find a place where they would do it here, in Blackpool. mascara-style effect, so your lashes are perfect from the moment you wake up. The price varies depending or where you go but I guess it wouldn’t be more than £45. I went to Lisa Jones Beauty here in Blackpool and she was doing a promotion this month of October where I only paid £29 but I think her regular price is £40 – I will have it done again no matter what the price is. It takes about 40 minutes to have the treatment done – pain free and with immediate results. I was so, so surprised when I opened my eyes and saw that I had long, fluttery, beautiful lashes that enhanced my eye shape, made me look more awake, fresh, beautiful. I wasn’t really expecting much as I was aware that my lashes were very short so I thought my results wouldn’t be as dramatic or evident as others were but I was totally wrong! They claim it can stay that way for six to eight weeks but I can’t tell you much about that. I have had mine done for almost 3 weeks and it still looks the same. I guess the tint does fade so that mascara effect will disappear before the 6 weeks but hopefully the lift should still be there. I will definitely have it done again. In fact, I have just messaged Lisa so she can book me in at the end of this month so I can go on my holiday with beautiful lashes. By then I would have had this treatment for 4 weeks and I will probably still have a bit of lift and volume but I want them freshly done for my holidays and my birthday. You may notice that I also had my brows done – HD Brows – but that is a subject for another post. Let me know if you want more information on it. In terms of after care, all I do is to apply vaseline to my lashes everyday in the morning and night. I have not used mascara since I had the treatment done as I think this would make it last not as long and also I don’t really feel like I need to. The LVL lash lift is something I recommend to everyone that wants long, curled, fluttery and natural lashes everyday without any effort. The reason why I love this so much is knowing that there are no fake lashes at all. These are my lashes with a little help of an amazing treatment. Feel free to ask questions if there is anything that I have missed talking about and please let me know if LVL Lash Lift would be something that you would go for! Previous Post Urban Decay All Nighter Foundation // Worth the Hype?